BASF will present its range of materials for the solar industry at the European Photovoltaic Solar Energy Conference and Exhibition (EU PVSEC), to be held from September 24-28 in Frankfurt, Germany. 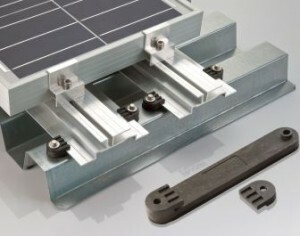 The company’s PV products include plastics such as Ultramid for solar panels, plugs and sockets; chemicals for cleaning solar cells such as eco-friendly SELURIS Clean; plastics additives like Uvinul and Irganox; metallization inks and pastes like CypoSol; and the COLO-FAST polyurethane (PU) spray system for framing photovoltaic modules. According to BASF, its Ultramid ultra-stiff polyamide belongs to the category of engineering plastics that has been shown to have a service life of 20 years in accordance with ISO 4892-2 Cycle 1. The material exhibits minimal creep tendency at high temperatures up to 80°C as well as extraordinary toughness and stiffness at low temperatures. In addition, Ultramid easily handles long-term direct contact with PVC roof membranes and conforms to the B2 fire class DIN 4102. By running proprietary numerical simulations, BASF was able to optimize the component’s design and verify that it satisfied the strength requirements. Since the plastic is easy to process, it is suitable for efficiently mass-producing injection-molded parts. Aixtra Solar AG has been using the Ultramid A3WG10 engineering plastic in its Aixtralight PV mounting system for several months. For the first time ever, BASF will be showcasing support components for ground mounts made from engineering plastics at PVSEC. The design will be illustrated by a prototype produced in cooperation with Joma-Polytec.